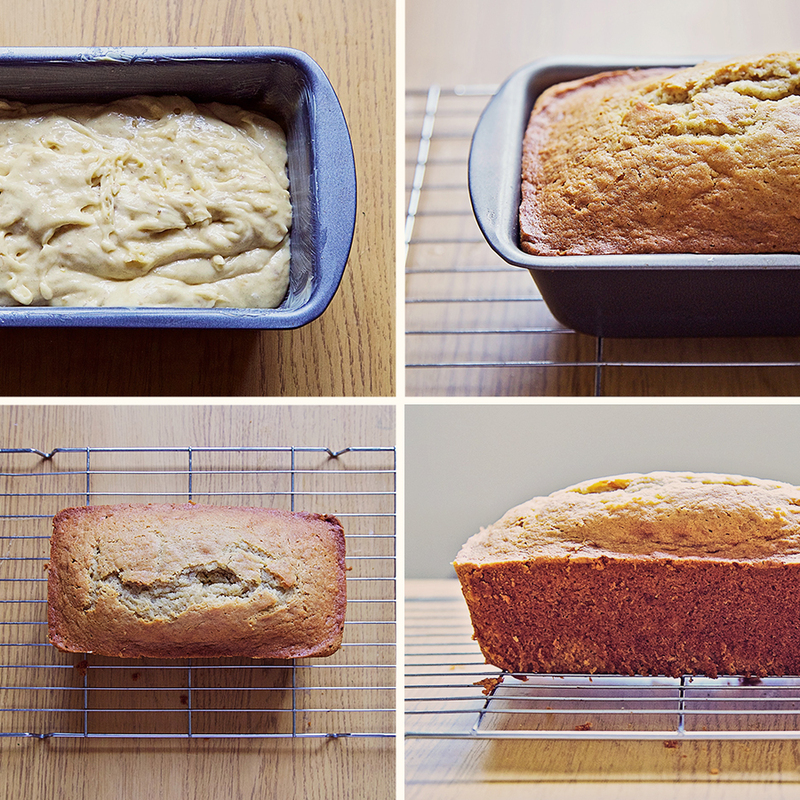 I love banana bread, it is so easy to make and really tasty too. I've been making this recipe very regularly for quite awhile now. As a kid my Mum didn't tend to bake very often but I distinctly remember her making banana bread for us using the leftover black bananas that we had lying around. She'd let me mash the bananas with a fork which I really loved to do so I can't have been very old at all! I think this was around the time I got my first children's baking set, (it was a teddy chef kit and I adored it!) so I must've been about six? Of course my Mum has made banana bread lots of times since then, but that is a memory that sticks out for me. Now I seem to have 'picked up the mantle' as the saying goes and I have become obsessed with banana bread once more. Harry and I had a chat about what makes banana bread so good recently and we agree that it comes down to it's simplicity. It is a great recipe to make when you have bananas lying around that have gone a bit soft or even black. I picked up about five or six bananas reduced to 10p for the bunch in Tesco a few weeks ago and just chucked them in the freezer, I've been making loaves ever since. The recipe is so easy, maybe even easier than a sponge cake?! I combine mashed bananas, butter, sugar (sometimes light brown, sometimes caster) self-raising flour and eggs in a large mixing bowl and whizz all the ingredients together. Next I pour the mixture into my little loaf tin and put it in the oven for about an hour. Thats it! Once I've taken it out of the oven it's important to leave it to cool. I then turn it out and slice it into eight, often hideously unequal, slices. It keeps in a tin for about a week and it is perfect for taking out to enjoy with a cup of tea in the afternoon. 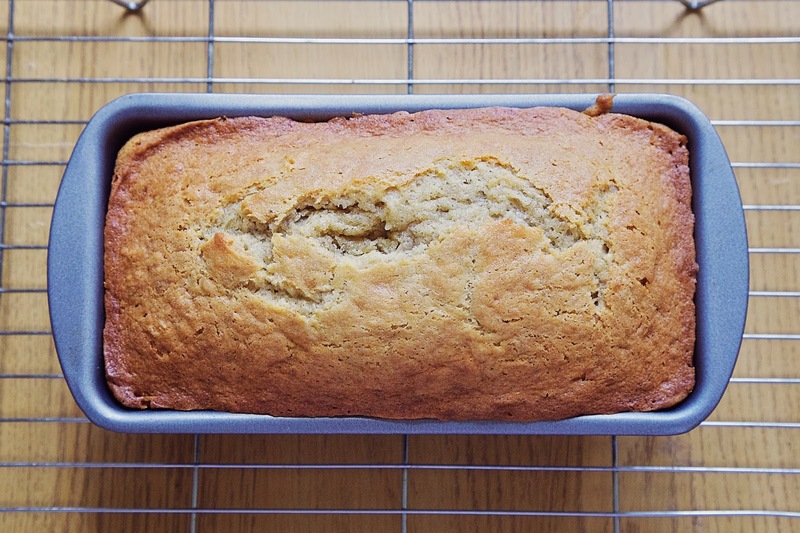 The beauty of the banana bread is that it isn't too heavy going. It isn't indulgent like cake, it isn't too sweet but it is sweet and moist enough to enjoy on its own. The trouble is you can all too easily go in for another slice and although it may contain bananas it definitely isn't low in calories! I try my hardest to only eat half a slice at a time but I seldom follow this rule! I use Mary Berry's recipe (she is Queen of bakes after all!) which is also the one I'm pretty sure my Mum would've followed, but I really want to try the banana bread recipe from my Hummingbird Bakery cookbook soon, just to see the difference.